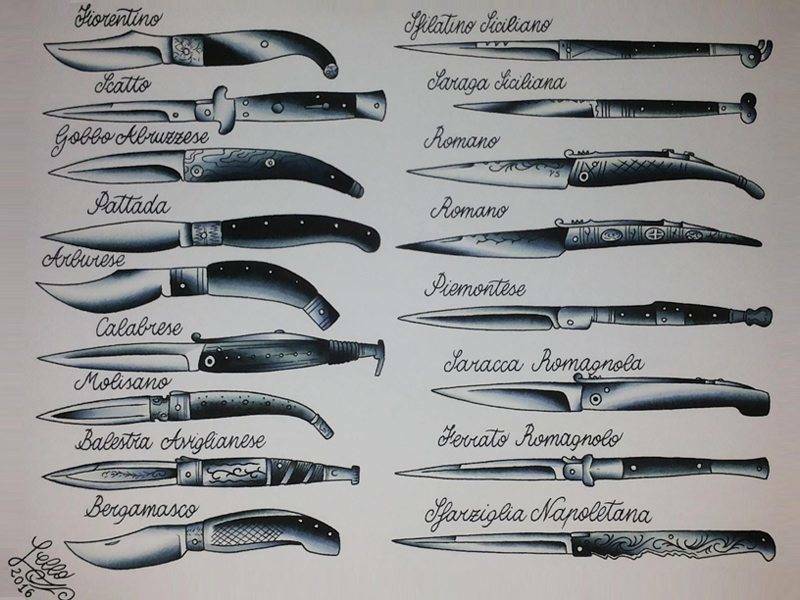 “Traditional Italian blades” by Italian tattoo artist Valerio Lello. Italy has 20 regions. Every Italian region has different dialects, recipes, cultures… and pocket knives. This article will go through the main pocket knives that originated in different parts of the country. It’s light and thin. Easy to open with 2 fingers. The famous knife from Pattada. It was originally used by farmers. The traditional knife from Bergamo area. A knife that had a very specific use: veterinarians and farmers would use it to castrate animals, and to execute small surgeries. Originally produced in Scarperia (Tuscany), but soon became popular in Lombardy region. It was widely used by criminals in Milano area. Fiorentino with Giglio sign, Florence coat of arms. 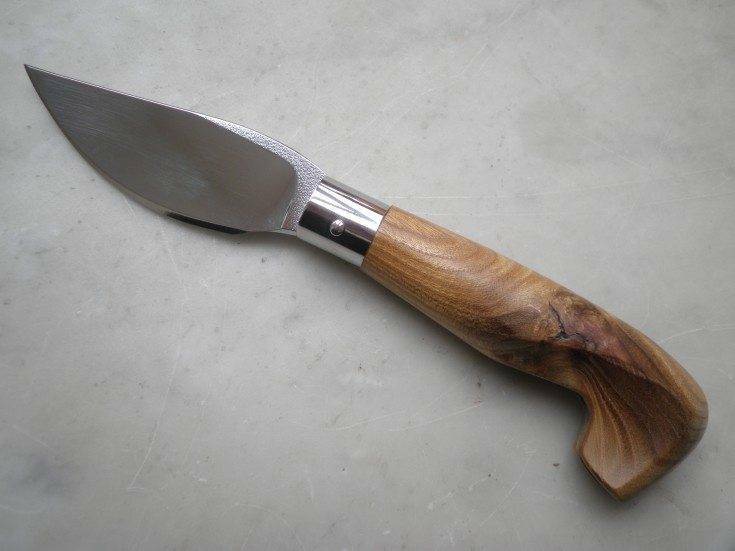 It’s the traditional knife from Scarperia (Tuscany). 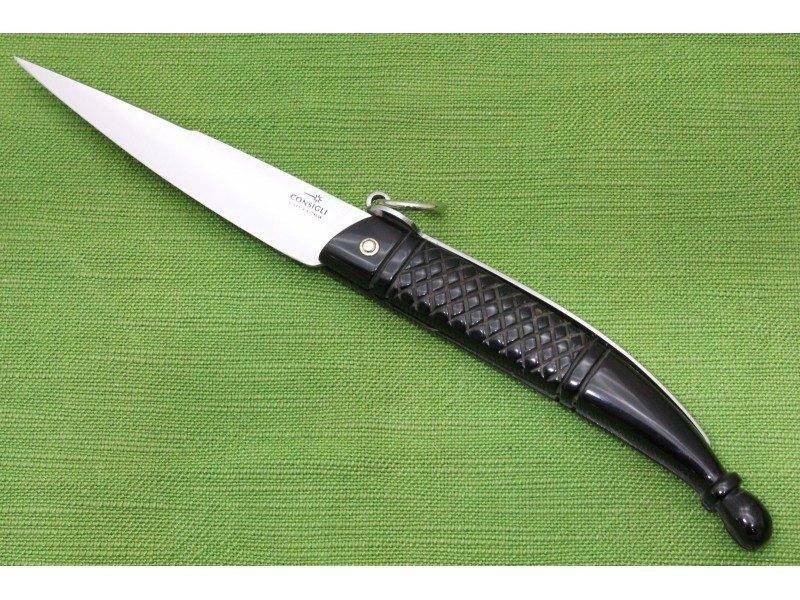 Produced since the beginning of 1800, it’s a light and practical knife. 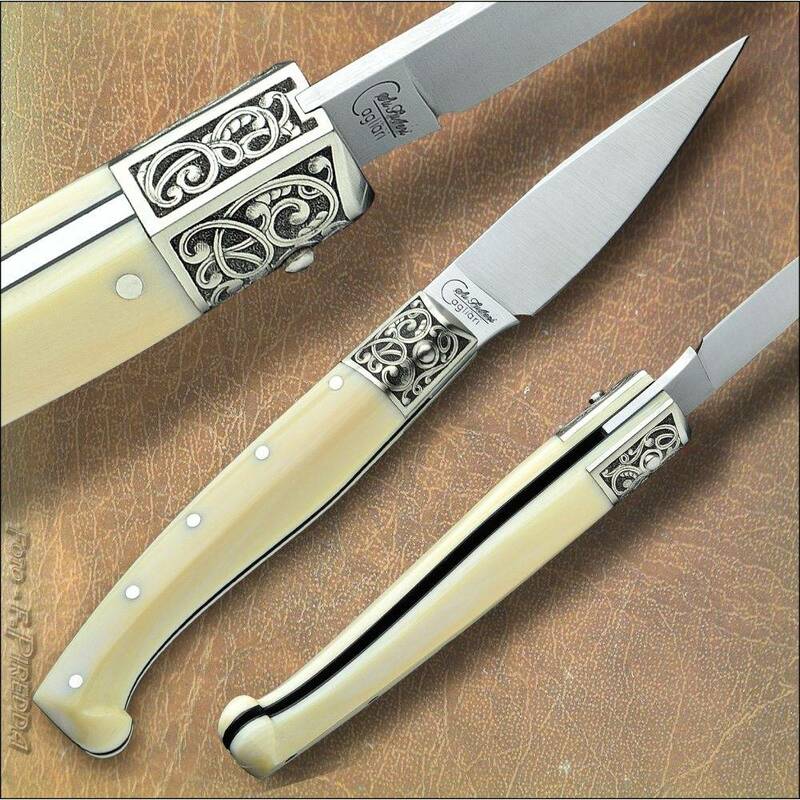 On the knives with deer horn handles, you can find the Giglio sign, that is Florence coat of arms. 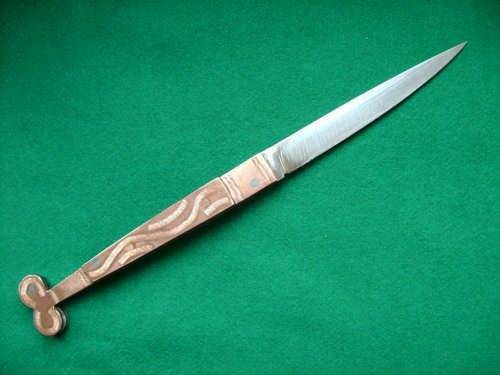 The Zuava is a traditional knife from Scarperia. 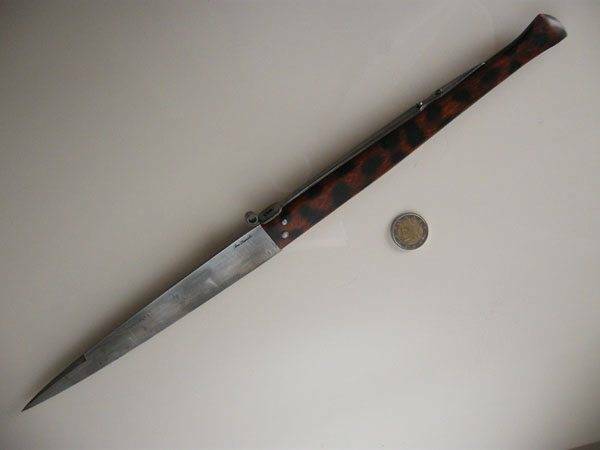 The name comes from the french military regiment Zouaves, that were equipped with a similar blade. 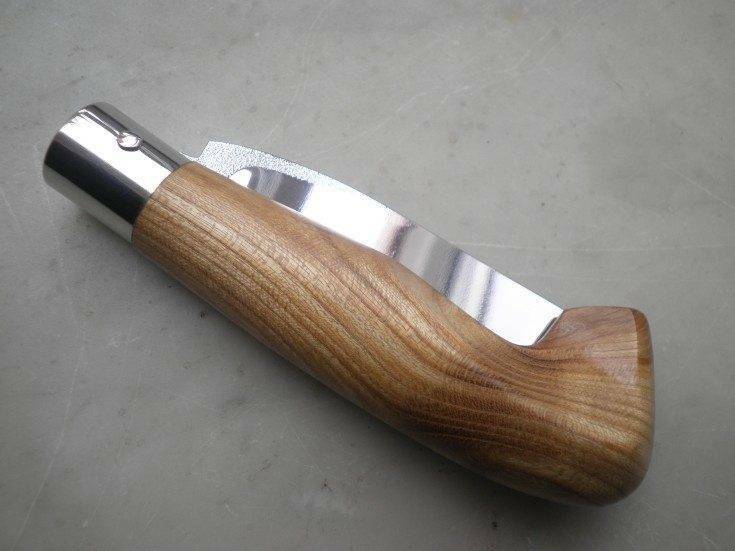 Handmade from the end of the 19th century, it’s a traditional knife from Scarperia (Tuscany). Even today, the Zuava is a functional pocket knife, not a self defense weapon. 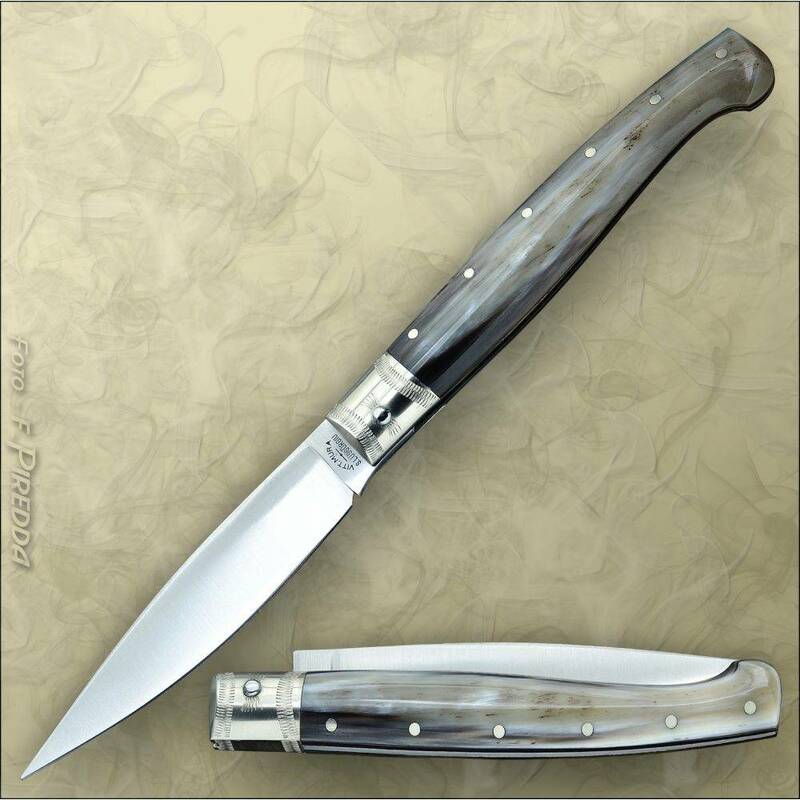 The shape is very similar to the Fiorentino, but it’s different because there’s a metal layer inside handle making this knife very durable. It was an indispensable tool to cut, eat, work and hunt, men wouldn’t go around without it. It was considered a very personal tool, jealously guarded, maintained and sharpened until completely unusable. It remained unchanged throughout the years, and it is still forged following the traditional techniques. Traditional knife from Scarperia, with a leaf-shaped (a foglia) blade. The main characteristic of this knife is that the blade is “cut” (“mozza”). 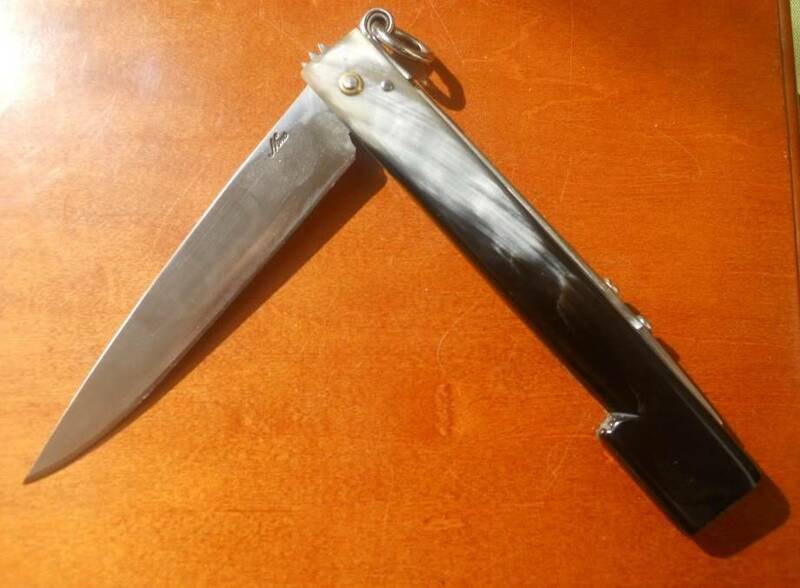 It was made like this because of the 1908 Giolitti law, which prohibited people from carrying pocket knives with the blade longer than 4cm (1,57 inches). But the limit for knives like this one, with the “cut” blade shape, was 10cm (4 inches), so that’s why this knife became very popular. It was sold as “permitted by law“. Tre Pianelle (Three Surfaces) is called like this because the blade has 3 different sides. This is a version made in Scarperia (Tuscany). A simple knife with one or two blades, used by office workers. The blades were used to sharpen pencils and to cut paper. This is not only from this region, but of central/southern regions in general. 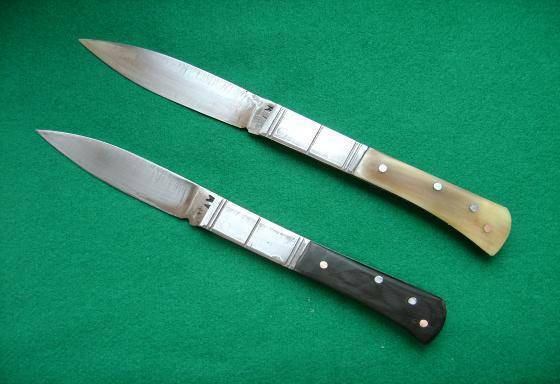 In fact, In some central and southern Italian regions, it was common to give a knife as a present for marriage, to make the relationship stronger. There was a strong connection between man and knife. 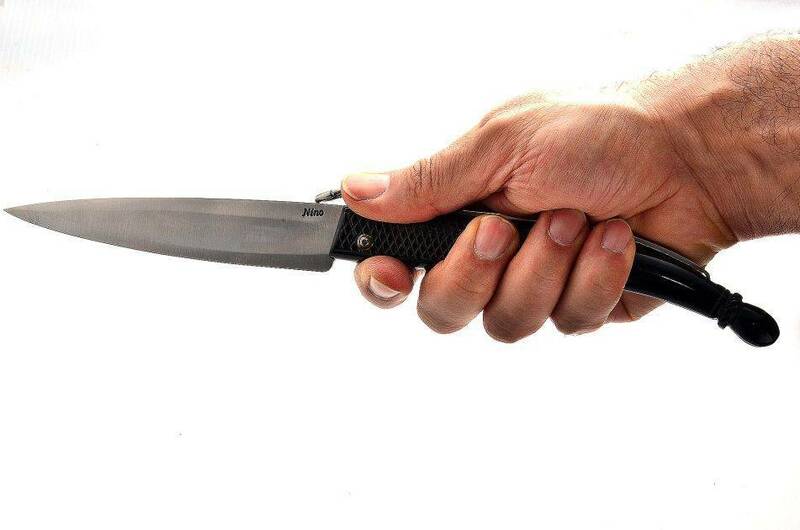 A man that gave such knife as a present to his woman, was symbolically giving himself to her. Such present given to a man, on the other hand, would represent his manliness. The eyes on the Love Knives would serve as a protection from Malocchio (evil eye). The blades feature traditional decorative elements. The Zompafuosso is a dueling knife. The name comes from “Zumpata” that means “Jumping” towards the opponent. Originally from Caserta. Characteristic straight shape from the handle to the tip. The knife in the picture can be found here. A traditional self defense knife from Avigliano. 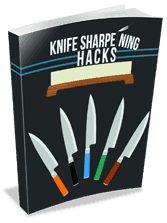 An interesting fact is that when the knife is opened, it does a ticking sound, 3 times until it is opened completely. This sound means that a duel is being declared, and the opponent will take his knife out accordingly. Fascinating knife from mid 19th century, originally from Loreto Aprutino. “Gobbo” means “hunchback“, name given because of its shape. Originally used by fishermen in the Adriatic sea. Still made by Nino Nista. A traditional knife from the north of Italy. 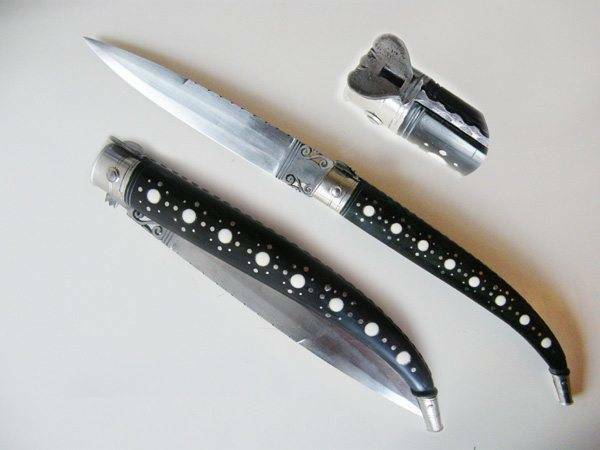 You can see 9 crosses and 9 moons on the blade. It’s because of an ancient proverb from the region, saying that “9 crosses and 9 moons kill all witchery“. Made to be used in vineyards, to prune, cut weeds and harvest. Traditional knife from Fabrosa. Still in production here. The original prototype was found in Roccaforte Mondovì. Traditional folding knife from Masone. 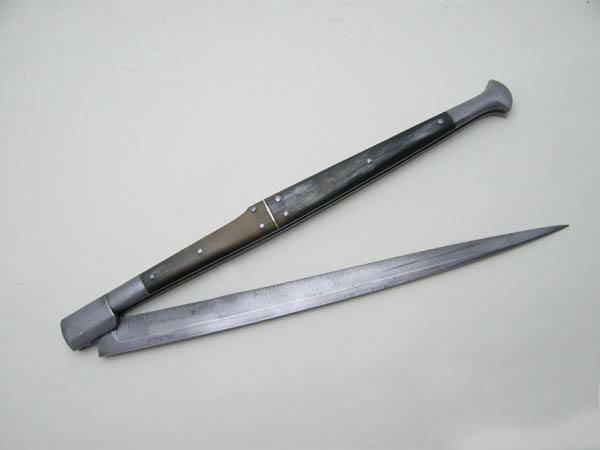 Dueling knife, originally from the 19th century. 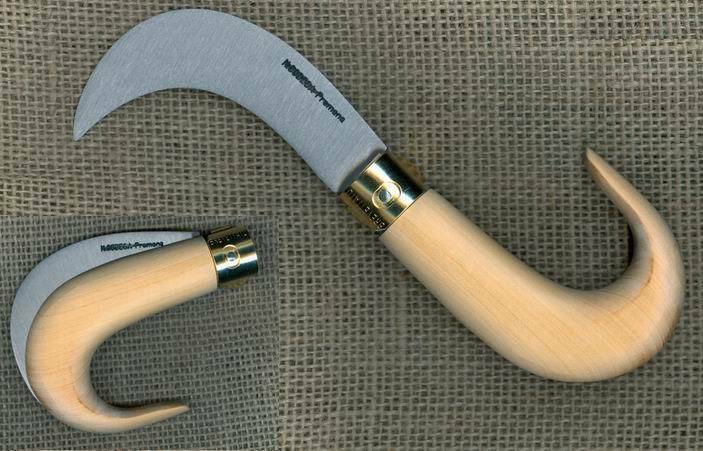 Traditionally from Calabria region, has been revisited also by Scarperia (Tuscany) knife makers. Classic knife with hidden fork. Model in picture revisited by Consigli. Traditional model with interesting handle shape. Wow, what a fantastic article, thanks so much! Do you know who made the pattada’s and the masunan? That masunan is simply a work of art! Masunin is made by Ottonello-knives.com, that picture is from a forum. It sold for 100€. For Pattada knives, you can check coltellisardi.com , tradizionisarde.com . Thank you for the information. So often I see beautiful blades without reference as to where to get them.